Do you know how you can make a good cheese taste even better? Let it sit out on the counter overnight. That’s what ol’ preggo brain here did last night, and the outcome wasn’t bad like I had feared. Actually, it makes sense – if all cheese are supposed to left at room temperature an hour before serving to heighten their flavors, 10 hours at room temperature must make a cheese 10 times as good, right? 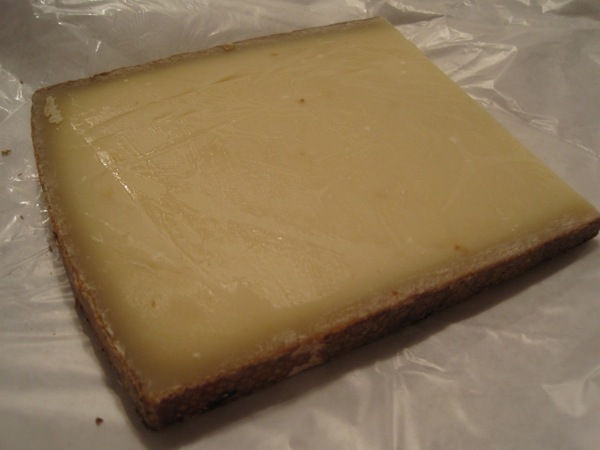 Anyway, the cheese we’re talking about today is Gruyère, the Swiss cow’s-milk cheese that, to me, is Swiss cheese. Though you won’t usually find holes in Gruyère like the commodity “Swiss cheese” features, this is the quintessential Swiss cheese – sweet, nutty and rustic. And while cave-aged versions, such as the 15-month one I bought, typically have a stronger flavor, I found my piece to be pleasingly light and creamy on the tongue. If I had a loaf of crusty bread around, I could have had the entire wedge of Gruyère and bread for breakfast and be totally satisfied. Alas, I’m eating oatmeal. Yawn. Gruyère melts well, so you’ll find it in a range of dishes, like gratins, quiches and soups. But to me, Gruyère means one thing – fondue. I’m all for trying new cheese combinations when making fondue, but the classic version features Gruyère as a main ingredient, and you can’t argue with that kind of star power. No matter how you prepare it, though, enjoy Gruyère with a light wine wine such as Riesling or a sparkling apple cider. When I first saw Parmigiano-Reggiano on the Wine Spectator list, I admit the first thought that came to mind was, “Duh!” It’s a no-brainer to include the cheese that sits tabletop at every Italian restaurant in the country. But many Americans likely associate it with a green can, and if you think I’m referring to that shredded junk, honey, you’re reading the wrong blog. The real Parmigiano-Reggiano comes from Italy’s Emilia-Romagna region and is D.O.P. (Protected Designation of Origin), which means that any wheel of Parm sold with that symbol is the real thing. Ask your cheesemonger to show it to you when he or she cuts you a wedge. Made from pasteurized cow’s milk, the cheese is shaped into 80-lb. wheels and aged for a minimum of one year and 20-24 months on average. 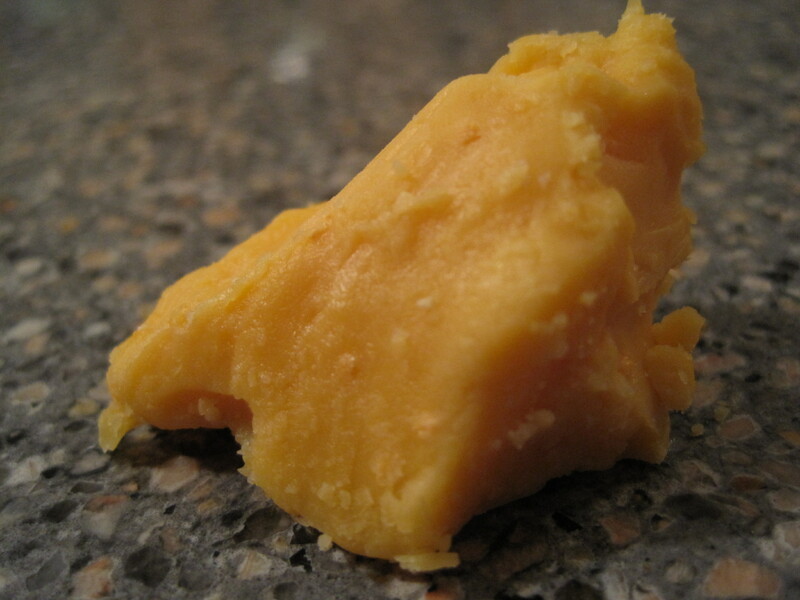 The longer it’s aged, the grainier and crumblier the cheese becomes and different flavors come through more strongly. Younger wheels of Parm often have notes of vegetables or grass, while older wheels gain fruitier and spicier tones. Personal preference (and cheese shop availability) can determine which kind you buy. Though Parmigiano-Reggiano is often grated onto pasta dishes or salads, it can also have a place of honor on your cheeseboard. Guests can tear off small hunks for snacking with fresh or dried fruit. Try thin slices with apple wedges – it’s a nice change from the traditional apples and cheddar combo. Wine pairings are all over the map. Wine Spectator recommends a sparkling wine, like Champagne or Prosecco, if you’re nibbling the cheese as an appetizer and Port for after dinner. The Consorzio del Formaggio Parmigiano-Reggiano suggests dry white wines for younger versions, building to full-bodied reds for the super-aged varieties. Pont-l’Évêque is a true table cheese – a staple on the Normandy sideboard for hundreds of years along with other regional foods like apples, butter, cream and cider. Not showy or high-maintenance, this pasteurized cow’s-milk cheese would round out any hearty meal nicely. Its meaty paste and nutty flavor could stand up to a number of rich dishes, French or otherwise, and would ensure that you don’t leave the table hungry. 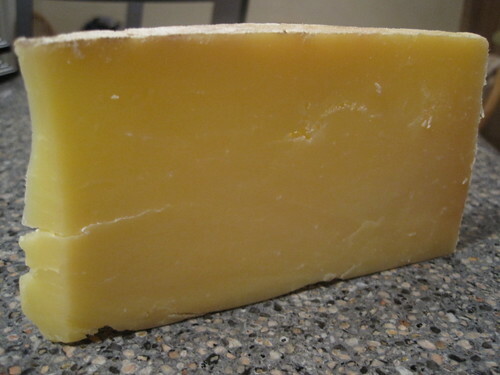 Like many washed-rind cheeses, Pont-l’Évêque is quite pungent. The wedge I bought at Surdyk‘s began stinking up my refrigerator as soon as I brought it home, and I actually finished the cheese in two sittings so the smell wouldn’t linger in the fridge any longer. 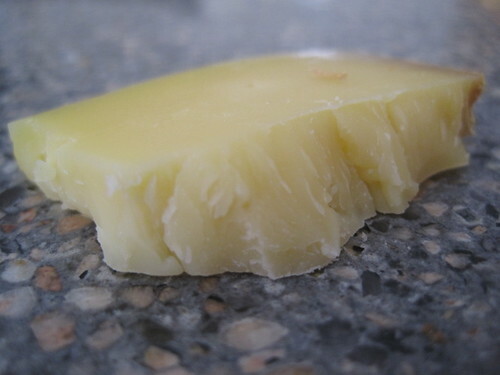 However, with this cheese, its bark is worse than its bite – the paste itself is fairly mild and shouldn’t overwhelm those with delicate palates. Pair Pont-l’Évêque with a fruity white from Bordeaux, as per Wine Spectator‘s suggestion, or go bubbly with Champagne. Of course, cider would make a stellar match as well. I must be on a Dutch streak because my cheese this week is another aged Gouda hailing from the Netherlands, though it’s often confused for an Italian cheese similar to Parmigiano. Roomano, not Romano, offers a delightfully sweet, butterscotchy taste like L’Amuse, but unlike last week’s cheese, this one features crystals scattered throughout the paste. Personally, I’m a big fan of crystals because I love foods with texture, so I happily crunched my way through this cow’s-milk cheese. The Roomano you’ll find will vary by age, anywhere from two years up to six. 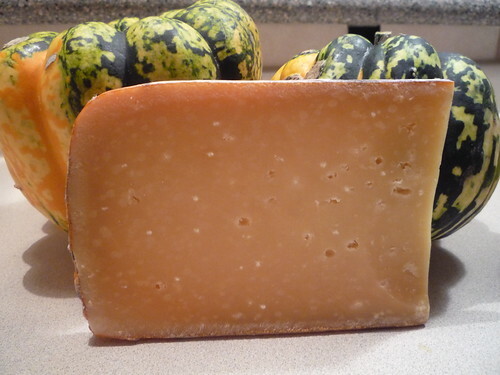 While all Goudas are suitable for snacking, I imagine Roomano would be an excellent cheese for grating and using in an autumn gratin, like with the squash pictured above. This recipe from Allrecipes.com calls for Gruyere and Cheddar, but I think the Roomano would make a fine substitute for one or both the cheeses. Pinch My Salt also has a recipe for a butternut squash and sweet potato gratin that sounds divine (and my 2-year-son might even eat it), and swapping out the Manchego for Roomano would be an interesting variation. If you get your hands on a piece of Roomano and use it in a recipe, share it with us!